1. 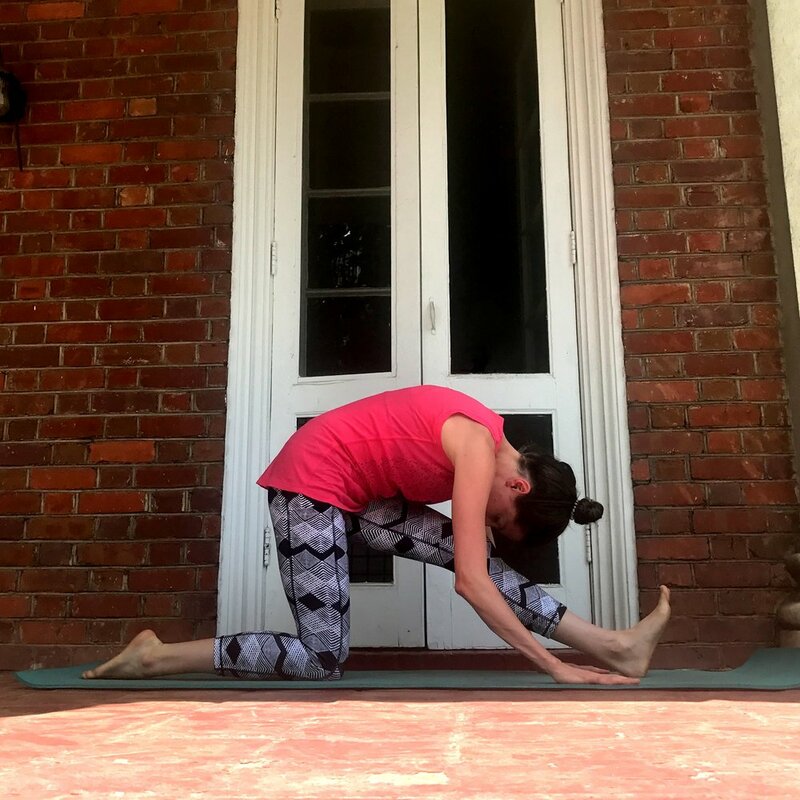 Wide-legged forward fold with a flow from side to side. After warming up, set up your wide-legged forward fold. Be sure toes are slightly pointed inward to protect your knees here. Pause and relax your head and neck, and take whatever hand/arm placement is working best for that moment. Here are some of my favorites: 1.) you can just grab opposite elbows and press them gently towards the floor, 2.) walk your hands through your feet, so that fingers are pointing the opposite direction as your toes, or 3.) wrap the first two fingers of each hand around each big toe to connect with your respective thumbs, and then use your grip to gently pull yourself towards the floor. After you pause here at least 5 breaths, check to be sure you are really relaxing your head. Nod it “yes,” or “no,” or both. (Truly relaxing is usually more difficult than you might think!) Now, use your breath to flow from side to side, from one leg to the other, as if your head is a dead weight and a pendulum swinging through the same plane. Inhale, and on your next exhale, let your head swing to the right leg. Pause and breathe here, then inhale to center and exhale to the left, to again pause and breathe. Take your time, and go side to side at least 3 times. 2. Low lunge to half split. This sequence is a key prep one for splits. In your low lunge, be sure your front knee is just above your front ankle and not jutting too far over it. Also be sure you’re not right on top of your back kneecap; if that’s the case, scoot your back foot farther back. In your low lunge, relax the quad or front of your back leg. Use your hands for support as needed. Inhale, then on your exhale, walk your hands back towards you, letting toes lift up off the mat, and shifting hips back so that front leg is straight. Flow back and forth from your low lunge to your half split. Keep in mind that you can totally stay working your half split if you’re not at a full split today. Another way to make your half split more intense: once in the pose, inhale your spine tall to come up out of the pose through your upper body, then exhale to refold over your leg. You will almost always get a deeper stretch through your calf. This pose is a wonderful yin way to work on your middle split, since gravity will always pull you to just the right place for you, and slowly work you deeper into the pose. You do need a good-size clear wall (which can actually be surprisingly difficult to find, in my apartment at least!). First sit sideways next to the wall, and then in one fluid motion, swivel legs up the wall as you drop to your forearms and then rest your back on the ground. If you’re still not against the wall, wiggle one side of your bum, then the other, until closer. Now, just let your legs slide down the wall. Pause and breathe 2-5 minutes, and then use your hands to carefully bring legs together, before bending knees and rolling to one side to come off the wall. Splits are a challenging pose that require you to listen to your body but are a helpful addition to your yoga practice. With the right warmup and a good dose of patience, you will be in splits and enjoying the benefits of all of the prep poses here too.